Many schools and clubs across the UK now choose to have synthetic turf sports facilities. One type of artificial grass we use has a thin layer of sand across the top of the carpet. We call this sand dressing, and it’s ideal for facilities where you play hockey. Sand dressed pitch construction starts off with the creation of the ground works and foundations. We first have to excavate the site for the sand dressed pitch construction, this is measured out to the specification that the clients have given us to ensure the facility is the right size. The foundations must be applied to a sub base; the sub base ensures that the sports pitch remains flat, so the playing surface is completely even. The sand dressed pitch will be an all-weather surface, allowing for the facility to be used all year round. 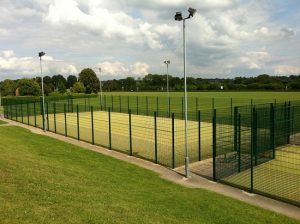 With sand dressed pitch construction there are a lot of variables that you can change to customize your sports pitch to suit your institution, for example you can have fencing installed around the surface, or you could have sports floodlighting installed to light up the surface, allowing for usage during the night time. The pitch is sand dressed to give the users some grip and also to make sure that the pile height remains the same throughout. 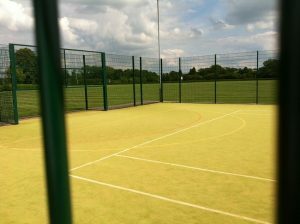 The costs to install sand dressed surfacing will vary from job to job depending on a few factors, the main factor being the size and dimensions of the sports facility the institution requires, as obviously the more materials and labour needed to construct the sand dressed surfacing, the more expensive the job will be. The costs to install sand dressed surfacing will also depend on any extra features you would like yours sports facility to have such as fencing, floodlighting or having a shock pad installed for extra safety. However we do offer variants of each, so you can get a cheaper option of fencing for you facility, this allows the customer more freedom over the specification of the sand dressed surfacing, helping them stick within their budget. Another method that can keep costs down in the long term is the pro-actively maintain yours sports pitch, this will ensure that any long term repairs and resurfacing isn’t needed due to the sports pitch being properly maintained. This will also make the pitch safer and the performance characteristics better. We aim to offer high quality products and services for a reasonable price. This gives the customer as much freedom as they like to keep within their budgets. We do this by reducing the costs to install sand dressed surfacing, but still producing a high quality product. If you want to get a quote for installing one of these facilities, please get in touch with our team today. We’d be happy to provide more information on sand dressed pitch construction as well as the other services we offer. Designs and prices can vary for each project so make sure to give us as much information as you can.